The University will give out stipends to a "handful" of prospective students, trying to convince them to enroll after they get a feel for campus. Updated: March 19, 2015 at 3:57 p.m.
For the first time this spring, officials will try to lure prospective students to GW by offering them a stipend to visit campus. That stipend would go to a “handful” of prospective students who are interested in coming to GW but can’t afford to make the trip for financial reasons, University spokeswoman Maralee Csellar said. Experts say bringing students to campus is a good way to give them a sense of the school and increases the chance that they will decide to enroll, which helps GW meet tuition revenue targets. Csellar said the stipend would cover a portion of travel costs for students within the United States who have already been accepted. She said if prospective students stay overnight, they will be paired with a current student for housing. Officials hope visiting campus will help students decide “whether GW is best fit for their educational future,” she said. “Choosing a college is about finding the best fit, and studies have shown that a student is more likely to choose a college after making an in-person visit,” Csellar said. None of GW’s 14 competitor schools give out travel stipends to bring students to campus, according to their websites. But Amherst College, which is not a peer, will cover the transportation costs to bring 100 minority students to campus for a visit, part of an effort to increase diversity, according to the school’s website. Nicholas Hillman, a higher education policy professor at the University of Wisconsin – Madison, said GW may need “those extra outreach efforts” to get students to visit campus because of its sticker price, which topped $60,000 last winter. “You’ve got a really expensive education that GW is trying to sell to students, and one way to convince them it’s worth it is to bring them to the campus,” Hillman said. Hillman said GW’s program is similar to ones that give stipends to potential graduate students to visit schools that may be far away. But he also said GW could “see a snowball effect” in the future if all students start to expect a stipend for a campus visit. Giving a stipend to students will help them get a better feel for campus and make an informed decision about which school to attend, said Lisa Sohmer, the director of college admissions at Garden School and a former member of the National Association for College Admissions Counseling’s board of directors. Steve Goodman, an education consultant and college admissions expert, said the stipend could be a tool GW is using to improve its yield – the number of students who enroll after receiving an admission offer. Inviting interested but undecided students to visit in April could convince them that GW is the right fit, helping the University fill the spots it needs to meet enrollment goals, Goodman said. Undergraduate yield has declined by about one percentage point every year for the last several years nationwide as students are each applying to more schools – making it more difficult for colleges to predict where they’ll end up. Officials said in a release that they plan to enroll a larger class of freshmen and enroll more international students next fall. 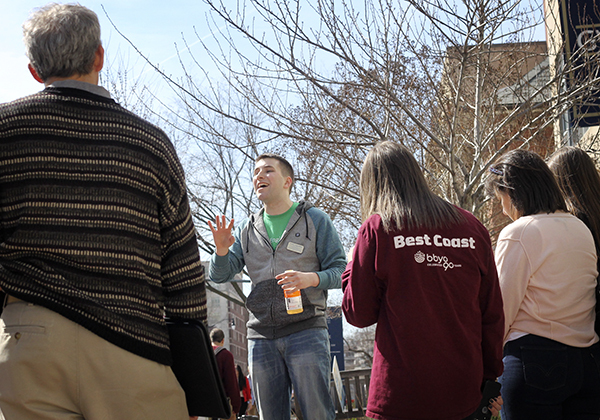 GW also extended the length of April campus visits this year, from four days to five. The number of applications to the University increased 4 percent from last year, according the release. About 750 students were admitted early decision. But Goodman said it is still difficult to know how much the stipend will help.